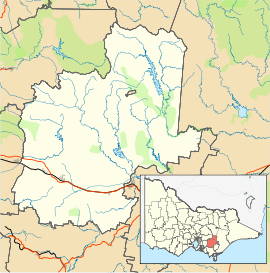 Drouin is a town in the West Gippsland region, 90 kilometres (56 mi) east of Melbourne, in the Australian state of Victoria. Its local government area is the Shire of Baw Baw. The town is supposedly named after a Frenchman who invented a chlorination process for the extraction of ore or an Aboriginal word meaning "north wind". New housing developments have accelerated the town's residential growth in recent years. As at the 2016 census, Drouin had a population of 11,887 people. Settlement in this part of Gippsland was rather delayed due to the dense forest. Pastoral runs were taken up but little developed. In 1867, a coaching station was established on the track into Gippsland at Brandy Creek, about 7 kilometres (4.3 mi) north-east of present Drouin. By the early 1870s, a small settlement had developed and land was being selected in the area. Meanwhile, contracts had been let for the construction of a railway from Melbourne into Gippsland. Workers' camps were set up along the route which passed to the south of Brandy Creek. There were three camps in the vicinity of Drouin. After the Gippsland Railway opened in 1878, a township was surveyed at Drouin Junction, soon known as Drouin. A post office opened on 5 April 1876 and was renamed Jindivick in 1878. A post office named Drouin Junction opened on 1 January 1877 and was renamed Drouin in 1878. As Drouin developed, Brandy Creek, now called Buln Buln, had declined. When the Buln Buln Shire was formed in 1878, the administrative centre was located in Drouin. The new Tourists' Guide described the township in 1889, showing its substantial development. Throughout the 1880s, a number of small sawmills operated in the Drouin district, many transporting their timber by tramway to the railway station. In the 1890s, a quarry was opened south-east of Drouin, the stone being carried by tramway to a railway siding east of Drouin. In 1913, this quarry was purchased and operated by the shire. As land was cleared, dairy farming became the main industry. Initially, butter and cheese were made on the farm. A creamery operated from 1891 to 1895 and in 1904 a co-operative butter factory was established at Drouin. When this factory was extended in 1907, an electric light plant was installed which also provided light for the streets and homes of Drouin. The factory supplied fresh milk to the Melbourne market from 1915. Over the years, the company acquired other dairy companies and enlarged its own operation, producing casein, skim milk and butter-oil as well as butter and cheese. It became part of the Bonlac company (now Fonterra) which later closed it down, removing the town's biggest employer. Flax was grown around Drouin during the two world wars. A private factory operated for a while and in 1941, the government constructed a factory to manufacture canvas goods for military use. The town has progressed steadily. In 1904, the population was 700. By 1933, there were just over 1,000 inhabitants and by 1970, 2,750. From the 1970s, the subdivision of an industrial estate on the south-east edge of the town had encouraged the growth of light industry. A number of housing subdivisions have also been initiated, as well as rural residential subdivision on the fringes of the town. The construction of a freeway bypassing Drouin allowed the remodelling of the shopping centre. By 1981, the population was 3,492 and in 1991 was 4,100. The Victorian Municipal Directory described the town in 1994. The town forms part of a combined urban area that includes Warragul. The estimated urban population for this area was 35,353 at June 2016. Drouin holds an annual Ficofolia Festival. Ficifolia are the flowering gum trees which occur throughout the town. This celebration includes the town gathering in the main street of Drouin and watching the local schools and participating businesses showcase who they are and what they do. Every year there is a theme which participants in the festival are encouraged to incorporate into their float or costumes. The participants of the parade begin from the Drouin Football Oval, through the main street, and finish at Drouin Civic Park. Here, the town continues its celebration with bands playing in the park, food trucks, rides, market stalls, and finishes with a movie in the park and fireworks. The town has a soccer team, Drouin Dragons Soccer Club, playing in the Gippsland Soccer League. The town has an Australian Rules football team playing in the Gippsland Football League. Drouin has a picnic horse-racing club, the Drouin Picnic Racing Club, which holds two race meetings a year with the Drouin Cup on Boxing Day (26 December). The racecourse is set on a golf course. Golfers play at the Drouin Golf and Country Club on Mcglones Road. Drouin's large retail stores include a Woolworths supermarket, and a Coles supermarket. Other businesses in the town include fast food businesses, hairdressers, restaurants, Tattersall's, and Westpac Bank. Several of the local businesses have relocated in recent times from the southern side of the shopping precinct on Princes Way (next to the railway station), due to land acquisition for the construction of a multistory retail shopping complex. Abbey's Cafe closed down, and the long-standing Drouin Cycles moved to a location on the other side of Princes Way. Drouin is serviced by three local papers - The weekly Warragul and Drouin Gazette, The Trader and the independent monthly and online paper the Warragul & Baw Baw Citizen. According to the Warragul Regional Newspapers website, The Gazette and The Trader are distributed to locations from as far as Pakenham to Moe and from Poowong to Noojee. The Warragul Citizen was established in 2011 as a quarterly print paper before becoming bimonthly in 2012, covering Warragul, Drouin and Yarragon. The paper's online news offering started in late 2011 and covers all of Baw Baw. The paper moved to being online-only in 2013, printing its last physical edition in February. It returned to print as a monthly tabloid covering all of Baw Baw in July 2014, changing its name to the Warragul & Baw Baw Citizen. West Gippsland Community Radio (3BBR) is based in Drouin. The radio reception available in Drouin also includes many of the Melbourne commercial stations (such as 105.1 Triple M, Smooth 91.5, 3AW 693, Nova 100), ABC Broadcasters (774 ABC Melbourne, 96.7 Triple J and 100.7 ABC Gippsland) and Gippsland commercial stations 531 3GG, 94.3 Star FM, 99.5 TRFM and Gold 1242. Free-to-air digital television signals containing programs from ABC TV, SBS TV, Southern Cross Nine, Prime7 and WIN TV are broadcast to the area from Mount Tassie in the Strzelecki Ranges, 68 km southeast of Drouin. Television transmissions from Mount Dandenong for the Melbourne market (Seven, Nine and Ten) can be received in Drouin and Warragul with a suitable roof-top antenna. Gary Ablett, Sr. - Played for the Geelong Football Club in the AFL, and was named the greatest player in the club's history. Dale Thomas - Currently plays for the Carlton Football Club in the AFL. Lionel Rose - Former world champion boxer and was the 1968 Australian of the Year from Jackson's Track, just outside Drouin. A statue of Lionel Rose was unveiled in 2010 in Warragul's Queen Street Park. ^ a b Australian Bureau of Statistics (27 June 2017). "Drouin". 2016 Census QuickStats. Retrieved 2 November 2017. ^ "Drouin". The Sydney Morning Herald. 2004-02-08. ^ Warragul Regional Newspapers (2007), Warragul and Drouin Gazette Circulation, viewed 4 May 2007. ^ "Announcement: Print edition hiatus - The Warragul Citizen". Retrieved 2013-04-03. ^ "Warragul & Baw Baw Citizen back in print and AVAILABLE NOW". Retrieved 2014-12-29. ^ ABC Sport (2006), Ablett named greatest Cat, viewed 26 May 2007.